The South African Krugerrand Gold Coin is the world's first gold bullion coin struck for investment purposes. The 22-karat gold coins were first minted in 1967, but were conceived in 1964 according to the South African Mint. It is believed to be the most widely owned bullion coin in the world. The Krugerrand is unique in that it does not carry a face value like most bullion coins. From 1967-1979, it was struck in just the 1 oz size. While the coin's gross weight is slightly more than an ounce, its gold content is exactly one ounce, making it easy for trading. That standard was later replicated in other precious metal coins from around the world. Since 1980 and up through to today, the Krugerrand is minted in fractional sizes of 1 oz, 1/2 oz, 1/4 oz and 1/10 oz. Although not as popular worldwide, the South African Mint also produces a collector proof gold version. No official silver versions are minted. 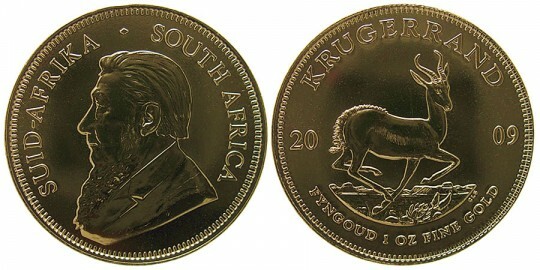 The obverse or heads side of the Krugerrand depicts Paul Kruger, who faces left and is surrounded by the arked inscriptions "SUID-AFRIKA" and "SOUTH AFRICA", which is the name of his nation in Afrikaans and in English. The reverse or tails side of the bullion coin features a prancing Springbok, which is a South African antelope and famous national symbol. Inscriptions included are "KRUGERRAND" the year of mintage, and the words "FYNGOUD", "1 OZ" and "FINE GOLD".